Our first day in Berlin had been less than pleasant in terms of weather. Cloudy, cold and little bit of rain. This day, however, was a little bit better. Cloudy, but other than good. Unfortunately I didnt have as much to do this day. My family dont really enjoy walking around very much. And dont really like museums. I like to go and see stuff. They like to take long breaks sitting in cafes but dont like to spend money on dinner. I like to eat out when I can (Except I like to cook when I am by myself because the kitchen is a great place to meet people). They dont like gardens (neither do I but at least it is something to do). It makes it very difficult when finding things to do that we can all enjoy. Or at least not hate. What we ended up doing was, first, going to Alexanderplatz. The, what i would call, centre of Berlin with the giant TV tower in the middle. We had a look around that area for a little while before getting back onto a train to Potsdamerplatz and having a quick look around there. The highlight was this huge complex that had restaurants, bars and cafes on the bottom floor as well as a cinema taking up a lot of room. Above all of that, on the other floors were shops and apartments with a room similar to the Burswood Dome as in it is held up without a central beam. I think I read somewhere afterwards that it is built on top of where the Berlin Wall used to be and it is kind of a symbol of Capitalism victory over Communism. From Potsdamerplatz, we went into Tiergarten and walked under all the trees that were losing there leaves so the whole place was a nice mixture of green, yellow and now grey of the heavy clouds that were now spitting on us. 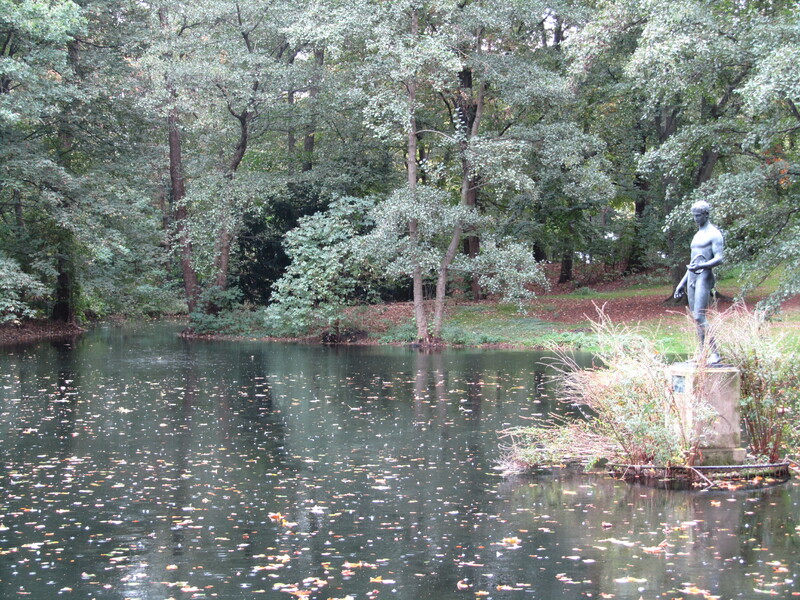 We headed into the direction of a huge monument that is located in the centre of Tiergarten. We managed to stumble upon a different monument set up by the Russian to honour their dead from the battle of Berlin. That was pretty impressive.. I guess.. Couldnt really read anything on it. We actually took shelter under it for a few minutes before getting going again towards our goal. After walking for a good 20 minutes, we found it. And it was waaay bigger than what I remember it being. It is in the middle of a round-about with tunnels going to the centre. 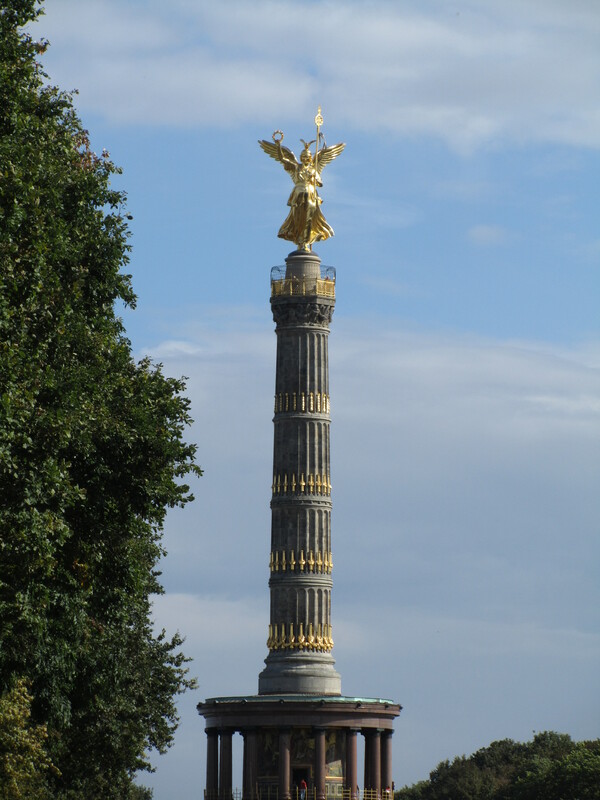 This one was set up as a symbol of the victories of the Prussians over France in particular. It’s a huge column with a gold angel looking thing at the top. From the Golden angel looking thing (as it will now be known), we got back on a train back to Alexanderplatz for some food which wasnt hard to find. They had some markets set up there with lots of different food including Bratwurst and crepes and other delicious, wintery goods. When we were all full up, and i had had a look at Shoestring (I still call our guide-book Shoestring. the guidebook we used last time was called Europe on a Shoestring and now it has become habit to call it that even though the book is just called Western Europe. ), we went to another nearby ‘shopping’ district called Hackerplatz which wasnt all that interesting unfortunately. People by this time were getting bored so we went back to the hostel where we sat around and used internet before going up to the top floor of the hostel where they have a bar. It is actually a really good view from up there at night and really disappointed i didnt get any photos. Oh well, next time. We had dinner at the restaurant next to the hostel which was themed Southern USA and then went to bed.